With the average child watching over 20 hours a week of television, and with statistics showing violent images shown on t.v. reaching over 8,000 per child, Education Outdoors Inc. has been embraced by families that long for a refreshing change in the types of products available to their children. 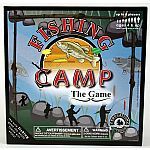 In a very short time, CAMP has received excellent support locally in Michigan, as well as nationally by selling over 1000 games in its first month. "It is our mission to bring families together to interact and learn about the outdoors".